longy wrote: I carry a cheap one, cause i lose it about once a month. Normally, I find them again, but I still lose about 2 per year. I'm not willing to take a $30 hit when I can take a $3 hit, and have virtually the same ability to do anything. I do keep a $50 (used, Ebay) modified Crunch in my BOB, but around town, i have a real tool kit in the vehicle, and a Cold Steel shovel, too. When you carry a gun, the knife's utility as a weapon means little or nothing. Lately, Gerber BG pocket tool. http://a.co/0csrvl8 It's a little clunky, but I lost 2 Victorinox Tinkers to security checks (second time was really dumb on my part, should have anticipated it, but I've always got a knife and didn't think of it) in a matter of months and wanted something a bit cheaper. Still has a proper Phillips, which I consider secondary only to having a blade. Vallyn. I have found large plotted plants and buried my knife in an airport or two. Always there when I returned. Your TSA theft of knives options and results may vary. Asymetryczna wrote: Vallyn. I have found large plotted plants and buried my knife in an airport or two. Always there when I returned. Your TSA theft of knives options and results may vary. I like that a lot, actually. Not sure it would have worked for that city council meeting, but I like it. EDC bags are a great idea! I remember using chewing gum to stick a tiny Swiss Army knife to the bottom of a pay phone in the airport. Needless to say, it was the only option I could think of in a hurry, and I thought it was a pretty good one. I flew back a few days later, and it was gone. I can only imagine how shady I must have looked on the security cameras. Boondock wrote: Swiss Army Knife--the Recruit or Tinker model, $20. Mine, too, except "Camper" model. Shot 'em, now I'm gonna hang 'em, then I'm gonna burn 'em! Damn Zombies. Can't ever be too dead to suit me. I've tried a few others, but I keep going back to the Spyderco Persistence that I've carried for the better part of seven years now. For a long time I carried various Kershaw and CRKT folders, but for the past two years I've been carrying a Spyderco Tenacious. Sure, it's one of the lower priced Spyderco blades, but it works for me and stays a hell of a lot sharper than the Kershaws I carried. I like it so much, I bought another one and then I bought a Spyderco Resilience a month ago. It's a bit big for EDC, but it'll still work if I do decide to carry it. 12_Gauge_Chimp wrote: For a long time I carried various Kershaw and CRKT folders, but for the past two years I've been carrying a Spyderco Tenacious. I can't stand CRKT's Safety catch in the back, seriously a knife doesn't need two locks. My Spyderco Tenacious is a favorite, it stays sharp as hell and deploys slicker than oil slick. The second safety thing is one reason why I stopped carrying my CRKT knives. And I'll agree on the Tenacious staying sharp and deploying quickly. 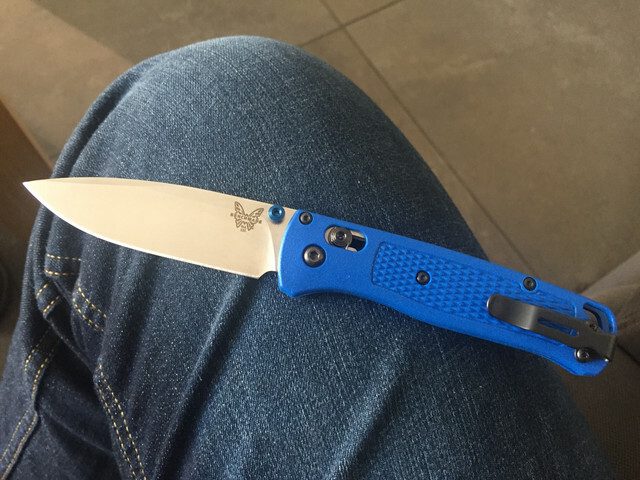 I recently bought a Kershaw Filter knife from Walmart for EDC. You can see it here on the Kershaw site: https://kershaw.kaiusaltd.com/knives/knife/filter. It has a "flipper" and is an assisted opening knife for fast deployment. It has a very cool "blackwash" finish and a very usable 3 1/4" blade length. Since the knife is all metal, it seems a little heavier and more substantial than some of the other pocket knives in my collection. The "blackwash" finish makes the knife look like antique metal like a firearm that has lost much of its bluing. The shape of the knife and the gray color reminds me a bit of H.R. Giger's depictions of aliens. This knife replaces the Kershaw 1550ST Blackout that I carried regularly for about 7 years. I still carry that one regularly, but I think it may have lost a screw or rivet somewhere along the way. I think I like the lighter weight of the Blackout a little better for EDC. But, the Filter is nice looking knife and will be in my pocket most of the time. People were once divided into hundreds of groups, but now there are just two: the living and the dead. I've recently changed to an Opinel No7, with beech handle and carbon steel blade. It is only suitable for light cutting tasks, but I'm using it more than I used my previous knife.